We want you to harness the power of culture and the power of people so that you can develop teachers and schools that are better than ever before. Imagine gathering at a local coffee shop with colleagues and friends. You have all decided to set aside time for positive, intentional conversation. The time to meet is open, informal and not bound to typical meeting norms or protocols. We are gathered around tables with hot cups of coffee, sticky notes embedded in journals and currents books we are reading. This meet-up may be enhancing the kernel of an idea shared during a faculty meeting sidebar. Perhaps, it’s an opportunity for a deeper dive from a blog or tweet you quickly shared. Regardless, the conversation is positive, inviting and rooted in harnessing dreams and thoughts into action. These are the conversations that can ignite inspiring things in service and support of kids, educators and school communities. This is the premise for the #JoyfulLeaders Slow Chat, an ongoing, positive conversation where everyone is invited to share, dream, and connect. The power of the hashtag is simply immeasurable. It has become a tool for connections and conversations. Many hashtags are established to promote something, so spread an idea or concept, and as an outlet for expressing thoughts around something particular. I (Bethany) had a dream of creating a hashtag where people could go to seek inspiration, be surrounded by positivity, and use their voice to impact others. I hesitated for many months, mainly because I was afraid it would not spread. One morning, I opened up my blog site and began writing. 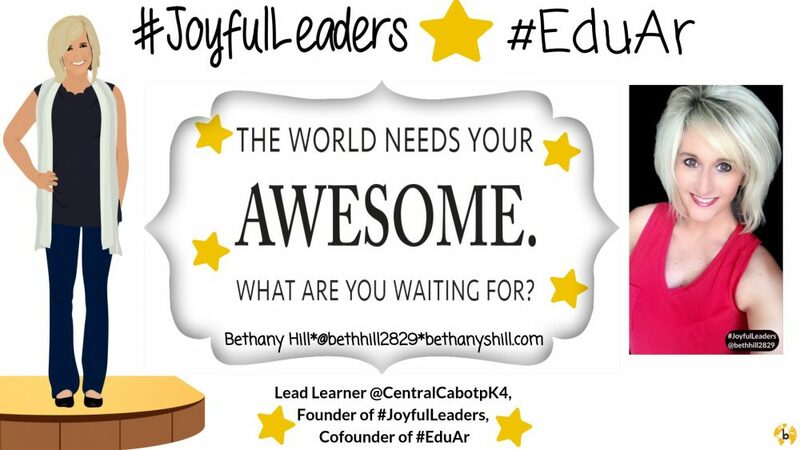 That is when #JoyfulLeaders was born (read the post here).My hope for this hashtag is for it to be an ongoing conversation filled with depth, celebrations, perspective, and reminders of our purpose as educators. I want it to be even more than a conversation…I want it to be a movement. Some days there is a slow chat question or a challenge of something specific to share, but each day is open for all things positive. The opportunity of adding value to the #JoyfulLeaders conversation came about through a conversation with my friend and eduhero, Sean Gaillard. He is the brilliant mind behind #CelebrateMonday, a hashtag that is now a movement in education. We discovered the power behind both conversations, and each Monday these hashtags collide. It has been incredible to see the sharing and the great things educators are doing for kids. We (Sean and Bethany) want to take this a step further by collaborating to form a book study slow chat through #JoyfulLeaders. We are thrilled to facilitate this ongoing conversation on the newly released book, School Culture Recharged, by Steven Gruenert and Todd Whitaker. We feel this book is a game changer in our profession, and want to learn along with other educators through Twitter. The fantastic thing about a slow chat is that there are no specific times to be online. Respond when you can, and follow the conversation through the hashtag. Our hope is that people will share their thoughts regarding each question we push out, but also interact with others by retweeting, quoting tweets to add thoughts, sharing images, replying, etc. Daily reflection is huge when learning, and school culture is our biggest priority. We are better together, and through #JoyfulLeaders we can connect for kids. This entry was posted in Edcucation, Leadership, learning environment, professional learning, Reflection, Relationships, School Administration, school culture, social media and tagged adult learning, Education, goals/vision, Leadership, Professional Learning, professional learning networks, Relationships, School Administrators, school culture, school leaders. Bookmark the permalink.